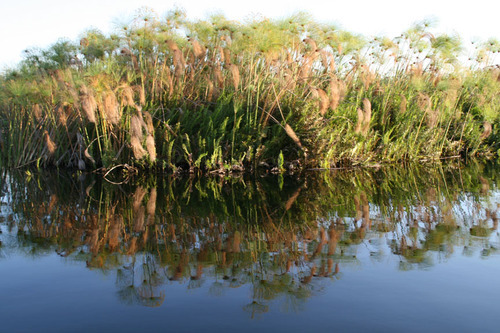 The delta is full of floating islands of papyrus. We canoed through narrow passages with papyrus arched overhead. The passages were kept open by hippos, who stay in the reeds out of the sun during the day due to their sensitive skin. They can be very dangerous, and we were wary as sunset neared. The danger was in stark contrast to my lasting idea of hippos as witty, fun and urbane a'la the film, Madagascar.